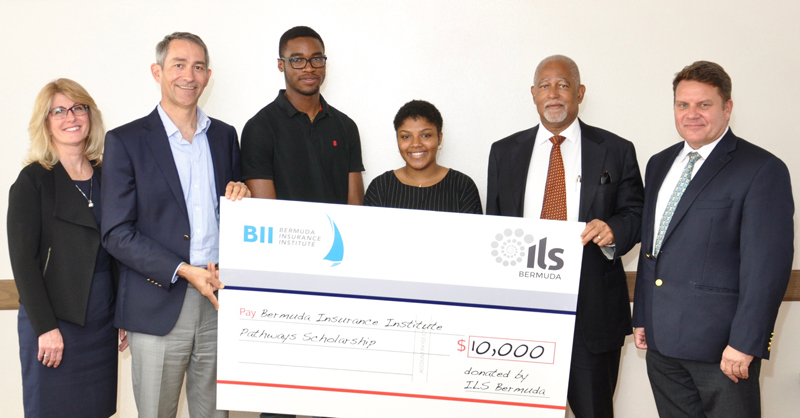 ILS [Bermuda] today announced Bermuda College students Bathsheba Jones and Khaleel Daley as the recipients of ILS Bermuda Scholarships enabling them to enrol in the Bermuda Insurance Institute ‘Career Pathways’ education initiative. Bathsheba Jones graduated from CedarBridge Academy in 2016 and is currently enrolled in the A.S. in Business Administration programme at the Bermuda College. Khaleel Daley attends the Berkeley Institute and is taking dual enrolment courses at the Bermuda College. Bathsheba and Kahleel will work towards an Associate in General Insurance [AINS] designation through the Bermuda Insurance Institute’s [BII] ‘Career Pathways’ programme. In addition to the two scholarships, the education initiative of ILS Bermuda offered 14 students complimentary attendance to the annual Bermuda Convergence event in October of last year along with complimentary lectures both before and after the event. The BII’s Career Pathways program is designed to provide identified high school and Bermuda College students with knowledge of a key segment of Bermuda’s economy. The ILS Bermuda sponsored scholarships will afford the selected Bermuda College students with an opportunity to earn an internationally recognised insurance designation as well as personal development through work shadow opportunities in the industry through partnership with ILS Bermuda member companies. The BII is Bermuda’s only comprehensive Risk Institute providing assessments, insurance and reinsurance courses, relevant seminars, conferences, and awards and recognition events. The Career Pathways program consists of 4 stages; an Overview Seminar for students, the BII Insurance Induction Program, courses towards the Associate in General Insurance [AINS] designation and work shadow opportunities. To date, Artex, the Horseshoe Group and global reinsurer Tokio Millennium Re [TMR], Bermuda have generously offered to provide work shadowing opportunities and access to professional staff members who are experts in their field. Artex is a global wholly owned subsidiary of AJ Gallagher specializing in the innovation, creation and management of insurance and alternative risk transfer solutions. They employ over 400 people in 15 international offices. The Horseshoe Group is a group of financial services companies forming a leading independent insurance manager and fund administrator dedicated to both the insurance-linked securities [ILS] and the alternative fund markets with offices in Bermuda, the Cayman Islands, the United States, Gibraltar and Ireland. TMR was originally established by Tokio Marine Group in Bermuda in 2000 and has since expanded as a top global Reinsurer. Outside of Bermuda they maintain offices in Switzerland, Australia, the UK and the US. Kathleen Faries, Deputy Chair of ILS Bermuda Ltd., and Head of Bermuda Branch, Tokio Millennium Re AG, said: “TMR is pleased to be one of the companies offering work shadow opportunities for the ILS Bermuda scholarship recipients. Several other top industry companies operating in Bermuda and part of the ILS market have indicated interest in participating in the education initiative. Tim Tetlow of ILS Bermuda’s Thought Leadership & Education team and Partner and Chief Operating Officer of HSCM said: “We are very pleased to announce the two scholarship winners – Bathsheba and Khaleel. 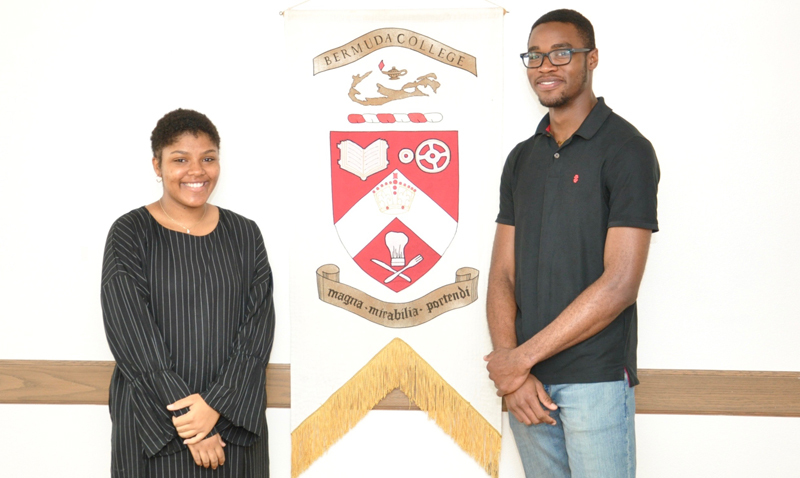 Last year they both attended annual Bermuda Convergence event along with 12 other Bermuda College students. Malcolm Butterfield, Chief Executive Officer of the Bermuda Insurance Institute said: “On behalf of the Bermuda Insurance Institute, we would like to extend our thanks and immense appreciation to ILS Bermuda Ltd for their generous donation this year to support Bermuda College students in achieving education opportunities within the context of the insurance industry. “The students who will be supported by this donation can be described as future insurance leaders and we are pleased to be one of the driving forces in this initiative along with ILS Bermuda and the Bermuda College “. Dr. Phyllis Curtis-Tweed, Vice President, Academic and Student Affairs, Bermuda College said: “Many thanks to ILS Bermuda and BII for developing the scholarship and work shadowing opportunities for Bermuda College students. Craig Simmons, Economics Senior Lecturer of the Bermuda College remarked: “Bathsheba and Khaleel have distinguished themselves in the classroom. I now expect them to do the same in the Career Pathways program as they pursue the Associate in General Insurance.